It’s the end of May already, and as expected HEAPS of stuff has been happening in the genealogy and history scene around this country. This covers news from any group, society, museum, or archive office throughout Australia. Some of the following news articles have been submitted to us, while others have been found from websites, newspapers and other articles. So if you are involved with any history or genealogy group, society, archives, or museum, or even just a special project and have news, events, in need of help or donations, or just have a request please advise, we’d love to hear about it and help you out. Family Historian Dawn Coleman is researching the early history of water skiing in Australia up to 1965 when the first World Water Ski Championship took place at Paradise Gardens, Queensland. Dawn would like to make contact with both recreational and competitive skiers from around the 1940s and onwards with a view to collecting their stories and perhaps a photo or two for an ebook titled: “Water skiing in Australia: The Pioneers’. You can email Dawn Coleman at storyteller4@bigpond.com. The ACT Government will provide $20,000 to help repair gravesites in Canberra’s original cemetery that were damaged by vandals. Fourteen headstones were badly damaged in the graveyard beside the Anglican Church of St John the Baptist in Reid recently, with the damage is estimated to be about $20,000. St John’s is the city’s oldest church, consecrated in 1845, 70 years before Canberra was named the national capital. The churchyard cemetery contains headstones dating from 1844. You can read the full story on the ABC News website. 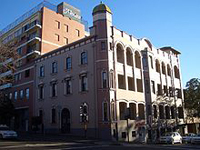 A snippet that was in Issue 4 of the Inside History magazine was a mention from Judith Godden who says that she’s been commissioned to write a history of Sydney’s (now-closed) Crown Street Women’s Hospital from 1893-1983 and would love to hear from anyone with memories of the hospital – as staff, patients or in any capacity. If you can help out, please contact Judith at the following: phone (08) 9876 4352, email: judith.godden@sydney.edu.au, or write to Dr Judith Godden, Honorary Associate, Department of History (A14), University of Sydney, NSW 2006. 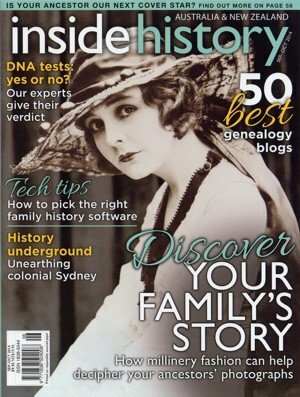 The Society of Australian Genealogists recently upgraded their subscription to The Genealogist.co.uk to the Diamond level, making even more of their records available to members in their library at 379 Kent Street. This brings to six the ‘pay to view’ sites that they offer without charge to members – FindMyPast.co.uk (including the 1911 Census), FindMyPast.com.au, Ancestry (library edition), The Genealogist.co.uk, The Origins Network and the DocumentsOnline download. Artist Daphne Kingston has spent much of her adult life recording the early colonial buildings of the Sydney basin. Daphne began to sketch Sydney’s earliest slab huts and barns in the mid 1970s, these rude timber dwellings were built by early settlers from locally felled trees. Remarkably, quite a number of them survived the elements for more than 150 years before their demise. This exhibition, Vanishing, showcases the drawings, paintings and photographs that Daphne compiled over the last 40 years of these buildings. Sadly I’ve only just found out about the exhibition which ran from 31 March to 12 May. However you can now view these images online on the Historic Houses Trust website. The School opened July 29 1861, and celebrations for the 150th anniversary of Ulladulla Public School will be held in August 2011, and includes the launch of a book about the school. The organising committee are looking for old photos of Ulladulla School days of the 1920s-1950s, plus photos of all past Principals. If you can help out with early memorabilia, please send an email to the Ulladulla Public School 150th Committee at 150ups@ulladulla.info or follow the Facebook page to keep up with the news. A family history day at Glengallan on Sunday 29 May was the culmination of Warwick’s 150th birthday celebrations. There was a display of more than 100 family histories, assembled by volunteer Jenny Walker which did attract keen interest as did the family history archive and database, officially opened during the afternoon. Since 1993, Glengallan Homestead Trust has been collecting and documenting history of owner and worker families and early settlers of the district. Over the past three years, in particular, a dedicated group working under the guidance of archivist Fr Brian Sparksman, has databased thousands of photographs and documents and collated a comprehensive series of early maps. They have also undertaken several research trips to Brisbane’s John Oxley Library which houses a significant collection of Slade papers from Glengallan and other Warwick-district papers. Future opening of the archives on Sunday afternoons will enable public access to Glengallan records for family or personal research as well as sharing of information, copies of photographs and documents to be added to the database. For more information about the Glengallan Homestead, you can visit their website. Adelaide’s Sunday Mail recently had a snippet about a reunion that is being held for passengers who arrived in Adelaide on the ‘Fairsea’ on 21 August 1961. The reunion held to commemorate 50 years since arriving, will be held on Sunday August 21 at noon. Contact Beryl for more information (08) 8362 3573. If you have ancestors who came to South Australia as miners in the colony’s first 15 years may be interested in attending the upcoming Australian Miling History Association conference to be held ain Hahndorf from 12 to 18 September. The theme is Australia’s Earliest Mining Era, referring to mining in the Mount Lofty Ranges from 1841 to 1851. Several guided tours of mining areas are included in the program. For further information please visit the Mining History website. The Narrung Progress Association community reunion day will be held on June 12th, which will celebrate the 100th anniversary of the laying of the foundation stone at the Narrung Hall. There will be a shared community lunch from noon and displays of events and uses of the hall over the past 100 years will be on display. Please bring along any memorabilia and photographs you have. For further information please contact Lorraine Rowe (08) 8574 0007, Marianne Cunneen 0437 320 779, or Lou Sanders 0429 640 081. Work has begun on the Tramway Museum’s new shed, which is being built to allow more trams to be restored and visitor numbers to grow. Demolition of the old tram running shed, which was built in 9165 from second-hand materials will begin this month. The new shed, which will house 10 of the museum’s 24 trams is expected to open in August. This is the only place you can see in motion a transport system of almost 100 years ago. You can find out more about the Tramway Museum by visiting their website. The 1st of May 2011 at the National Trust Museum in Strathalbyn, saw the launch of a new book written by Terry Watson on the Watson family. Titled ‘Soldiers, Farmers and Others: A Watson Family History, this 218 page book can be obtained direct from Terry. You can contact him by phone: (08) 8536 8135 or email elaine@netspace.net.au. The South Australian Genealogy & Heraldry Society now has a new Interest Group specifically for those who wish to discuss and find out about DNA in Family History. The group meets once a month from February through to November. Please send an email to saghs.admin@saghs.org.au for further information. Police at Albany on Western Australia’s south coast are investigating reports that hundreds of historic gold coins have been found in a local car park during excavation work. Workers say they found about 300 gold sovereigns, inscribed with the year 1800, buried under concrete next to a building on Stirling Terrace. Coin experts estimate their value at more than $500,000. The owner of the building says he did not know anything about the coins. The Round House is turning one hundred and eighty. To celebrate the Fremantle Heritage Gudies are conducting Tales of the Round House. The Round House is the oldest public building in the State of Western Australia. Opened in January 1831, just eighteen months after settlement, it was built to hold any person convicted of a crime in the settlement and was used until 1886. Tours will be held on Sunday 29 May, Sunday 5 June and Monday 6 June 2011 at the Round House, 14 Mrs Trivett Place, Fremantle 6160. Further information can be found on the City of Fremantle website, or by contacting Les Green of the Fremantle Volunteer Heritage Guides on (08) 9337 6525.